Mobvoi’s TicPods Free have an AirPods body with a sportier soul. It’s no secret that there are numerous ways Apple could improve upon its industry-leading true wireless AirPods. 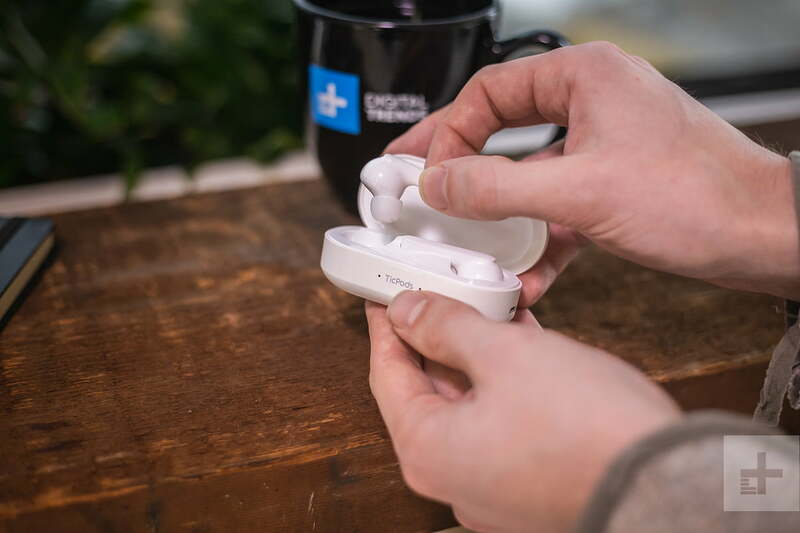 With a number of great options that now offer a more comfortable fit, water and dust resistance, and better sound, the company’s wireless in-ears have fallen enough behind the cutting edge models that we now recommend most people consider more contemporary alternatives. 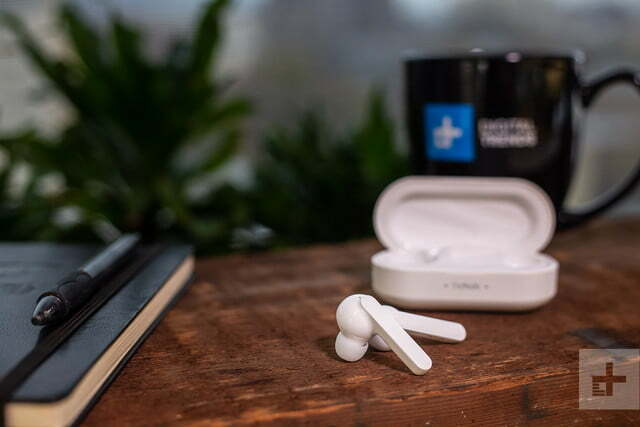 On paper, Mobvoi’s doppelganger TicPods Free check most of the AirPods’ missing boxes. With comfortable silicone eartips and the ability to withstand even the toughest workouts — plus a cheaper $130 price tag – they’re almost a no-brainer. We say almost because, while they have a lot of great features, they fall just short of AirPod-level battery life. 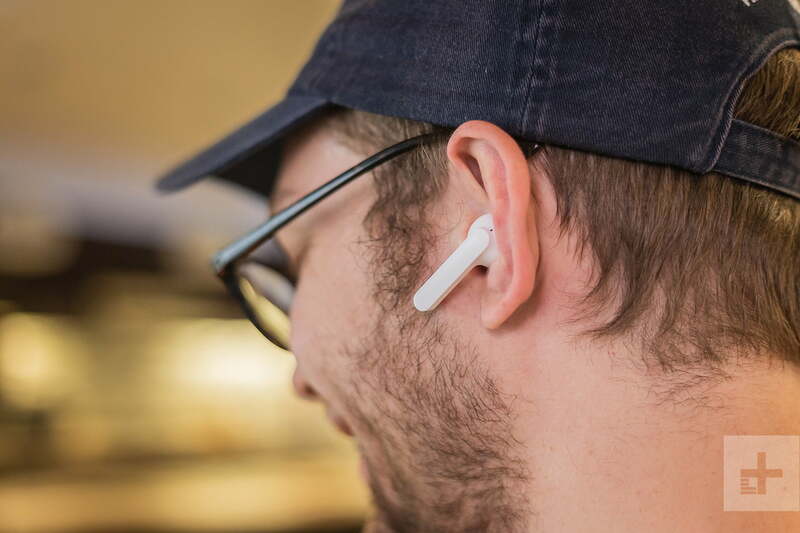 If you’ve ever seen the golf tee-style AirPods (and who hasn’t these days? ), the TicPods Free will be instantly familiar. 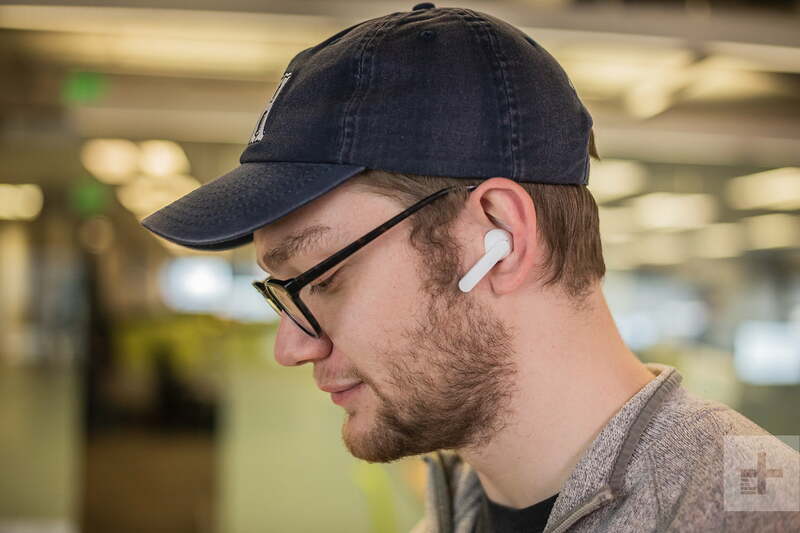 As far as we can tell, these headphones have been explicitly designed to fool everyone you pass on the street into thinking you’re an AirPods owner. The only real aesthetic difference between the Apple and Mobvoi headphone models is that the TicPods Free have a flatter stem, which actually makes accessing the onboard touch controls even easier. Controlling the headphones is fantastically simple. Swiping up or down on the left earphone’s stem adjusts volume, long-pressing the right bud brings up your voice assistant, and double tapping skips songs. Like the AirPods, the TicPods free even sense when they’re removed from your ears and auto-pause music — functionality that comes in handy more often than you might think. Fool everyone you pass on the street into thinking you’re an iPhone owner. 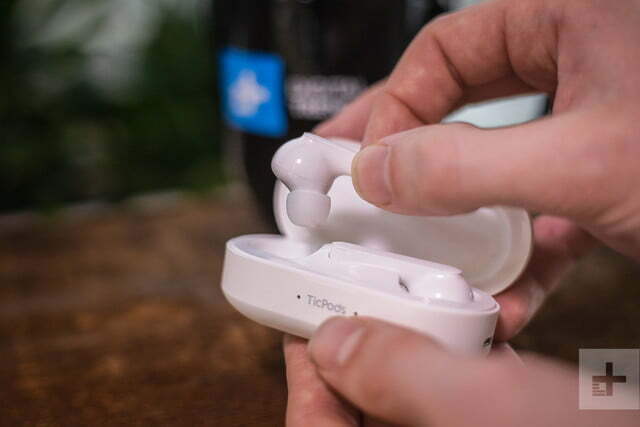 The TicPods Free do offer two key design differences from the AirPods that are very significant: Silicone eartips, and an IPX5 water and dust-resistance rating. 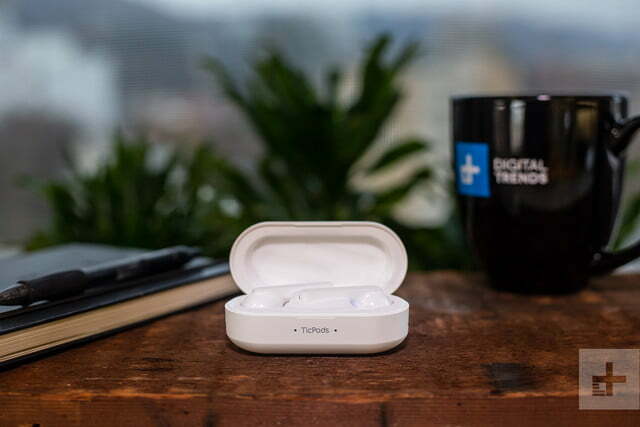 This equates to a more secure (and comfortable) seal in your ears — along with better passive noise isolation — and the ability to withstand rainstorms and sweaty workouts. 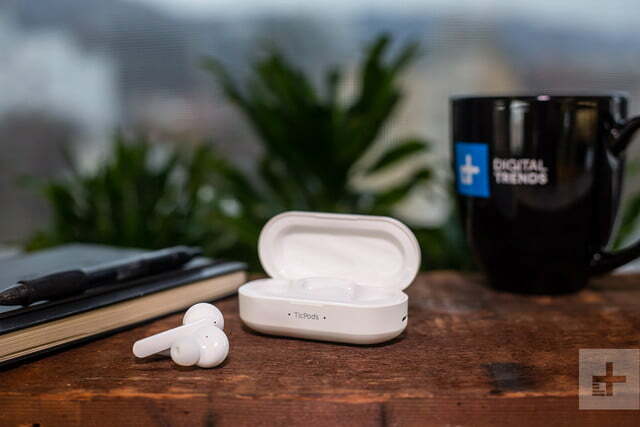 They come in a pill-shaped white charging case, offering a total of 18 hours of listening time on the go with both the case and headphones fully juiced up. That brings us to our only real gripe about these headphones: Battery life. At four hours maximum play time, the TicPods Free have an hour less than the AirPods. And that’s a shame, because four hours is just not quite long enough to get heavy users or commuters through their day. The silicone eartips alone make a huge difference in terms of listening experience when compared with the hard plastic of the AirPods. 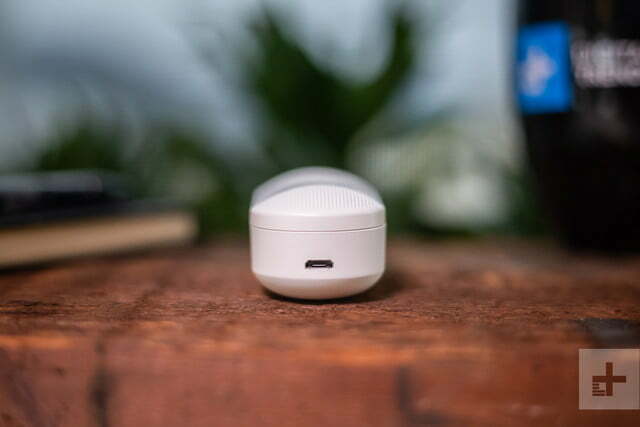 Mobvoi’s headphones have more exacting bass and a more dynamic sound signature than the AirPods, even though they may not actually have better drivers — having a good seal in your eardrums is just that important when it comes to getting great sound. Whether jamming out to our favorite new hip-hop or shimmering Bob Dylan classics, all of our tunes were faithfully reproduced by the plucky true wireless in-ears. In fact, these earbuds offer among the best sound we’ve heard in the genre for the money. There’s a healthy amount of volume too; we often find that true wireless in-ears can’t quite keep up with the loud atmosphere of a jog down a busy street, but the TicPods Free had no issues at all. That said, cranking the volume does take a toll on battery life. Mobvoi offers a one year warranty on defects in materials and workmanship. 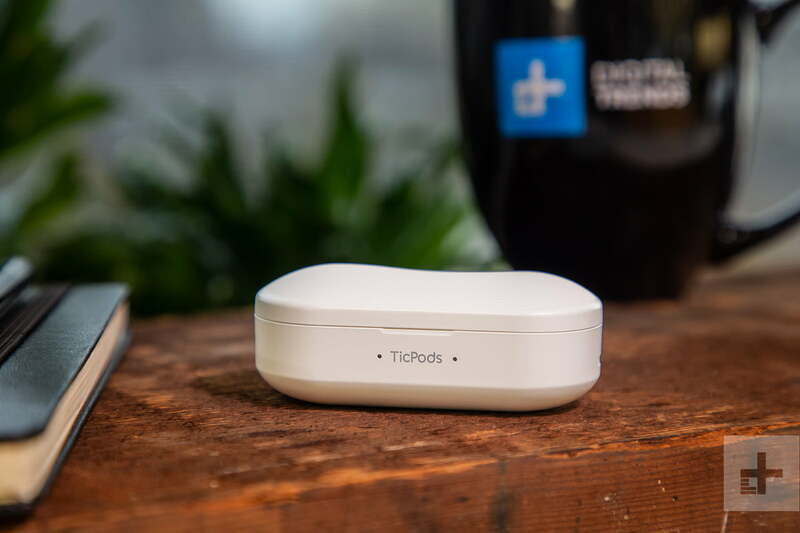 The TicPods Free are a solid AirPod alternative with better sound and a number of better features at a more affordable price. Not without bumping up your budget a bit. 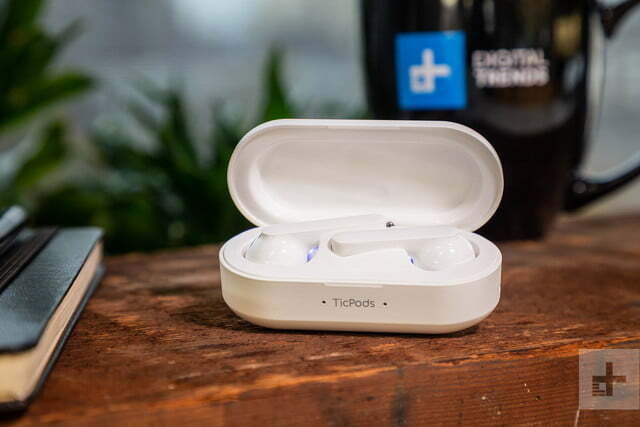 For $130, the TicPods offer the best blend of sound quality, life-proof design, and ease of use we’ve seen below $150. 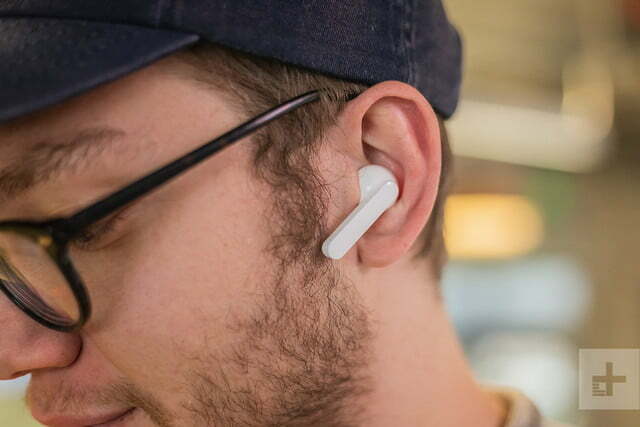 Apple’s AirPods will land you better battery life for $159, but you’ll be ditching the TicPods’ more comfortable eartips and water resistance. The Jabra Elite 65T and Elite Active 65T, beat both for $170 and $180 respectively. Mobvoi isn’t exactly a time-tested company in the world of headphones, but we can say that we feel that these had a solid build quality, and we didn’t feel they would fall apart during extended use. We spent a few weeks using them in everything from the office to long rainy runs, and they held up just fine. Yes, if you want identical looks and find yourself using earbuds frequently during workouts, we recommend them. 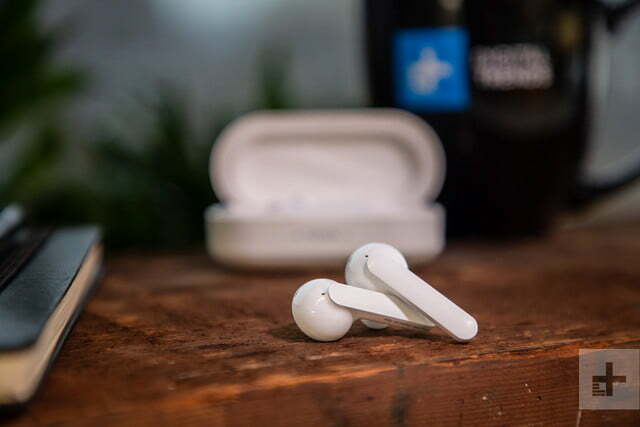 The TicPods Free served us well during sweaty gym sessions and lengthy outdoor runs, with the silicone eartips keeping them securely in our ears, and the IPX5 rating meaning we weren’t afraid of damaging them on the go. If you’re an all-day listener who wants a lightweight musical companion, we still recommend you opt for a pair of true wireless in-ears with longer battery life. As it stands, the 5-hour battery life offered by the AirPods and Jabra’s Elite Active 65t — still our favorite true wireless earbuds on the market — is well worth the extra money, as far as we’re concerned.